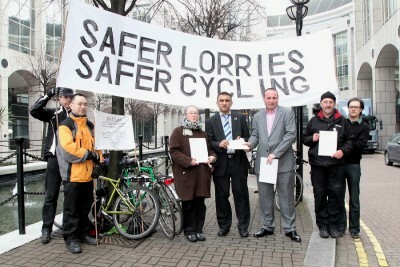 The letter highlighted that large lorries are involved in about half the cyclist fatalities in London and in the past two years, five out of the fourteen cyclist deaths involving large lorries happened in LB Tower Hamlets. At the start of the Safer Lorries campaign, an initial assessment by the LCC of each London borough regarding their commitment to lorry safety gave Tower Hamlets the lowest ranking. With the delivery of today's letter, Wheelers and LCC have now opened a dialogue with the council to work towards improving this ranking and ultimately supporting this campaign's pledge.